AlienSpy is a cross platform Java RAT with support for Windows, Linux and Mac systems. 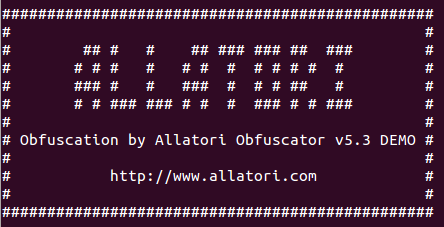 The samples I was able to analyze used a demo version of the Allatori Java Obfuscator (v5.3) which can be seen in the obfuscated method naming and Splash page shown when the malware is launched. I won't dive into the Allatori obfuscation methods or the container in detail other than to understand how the malicious jar is encapsulated within the package. 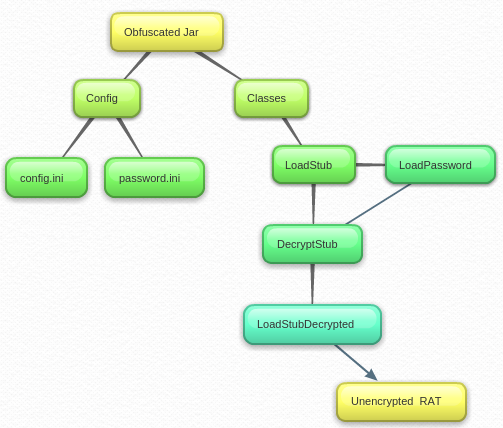 The container has a simple structure containing two resource files (config.ini & password.ini) and four class files. Once executed the container follows a simple path to decrypt and execute the payload. Analyzing the decryption method in the DecryptStub class shows the encryption has changed from previous versions. The payload stored in the config.ini file is encrypted using RC4 and the decrypt key is composed of the sha256 hash of a dynamic key stored in the password.ini file and a static key defined in the LoadPassword.class. Looking at the de-obfuscated strings in the LoadPassword class shows the static key as ALSKEOPQLFKJDUSIKSJAUIE. 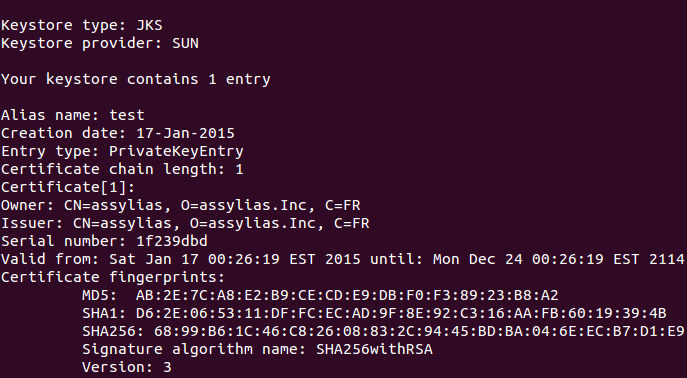 The sha256 hash is then created from the combined dynamic and static key. To extract the properties (config.xml) or the entire payload I've put together a script to decode the latest version of the AlienSpy rat. Once the rat is decoded we can decompile it and take a look at the layout and functionality. The decoded AlienSpy RAT has a simple layout containing a two resources config.xml & keystore.test and a collection of classes within three packages. 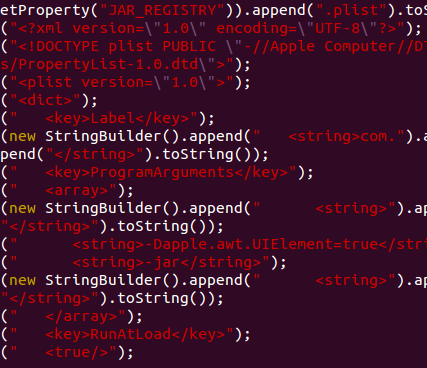 When the malware is launched it checks the INSTALL property which is populated from the config.xml resource. If the property is set to True the installation method is triggered using the following properties to generate the directory and file on the host system. On Windows systems the malware is copied to new directory with %appdata% and a new value under the Run key is created to launch the malware. The value name is the string defined within the JAR_REGISTRY config setting and the value is the command line to launch the malware 'java -jar <path-to-jar>'. The jar path and file name is defined by the JAR_ properties described above. Depending if the user is a local administrator or not the value is created under the Run key in HKLM or HKCU to either infect the system or only the current user. To check if the user is an administrator the file tem.txt is created within the Windows directory and deleted. If this succeeds the Administrator Property is set to true. On a Linux system the jar file is copied to the hidden directory <JAR_FOLDER> within the user's home directory and renamed to <JAR_NAME>.<JAR_EXTENSION>. The malware then creates a .desktop file within the users autostart directory ~/.config/autostart/<JAR_REGISTRY>.desktop to launch the RAT when the desktop is started. The generated configuration file has the optional key RunAtLoad set to true; this instructs launchd to run the job once when it is loaded. Once the job file is created, it then runs the command "chflags hidden <JAR_FOLDER>" to set the hidden flag and hide the directory from the UI. When executed AlienSpy checks if it is running within either a VirtualBox or VMWare environment. If it detects that it is running within a VM the application exits. The detection technique isn't advanced and is done by detecting files installed as part of the VM host guest tools. For VirtualBox this is either the file "/etc/init.d/vboxadd" in Linux or the directory "Oracle\Virtualbox Guest Additions" in Windows. If the RAT is running within a Mac environment it returns false. Similarily for VMware this is the directory "/etc/vmware-tools" in Linux "/Library/Application Support/VMware Tools" in Mac and "VMware\VMware Tools" in Windows. AlienSpy uses SSL Sockets to communicate with the C2 server. The server and port are both defined within the config.xml file. The jar file contains a keystore resource keystore.test which is used to trust the C2 SSL certificate. Using keytool we can look at the contained certificates. When examining the certificate details I was able to trace it back to a how-to post on SSLSockets and creating a keystore. The majority of settings for the certificate have just been directly copied from the examples in the article (keystore name, password and certificate properties). To subscribe to the C2 server the rat first creates and configures the SSL connection then sends 1 then sends the properties describing the host system. At this point the malware is in listening mode waiting for commands from the C2 server. Once connected to the C2 server the RAT waits for a command. Commands have a simple syntax of command_id [1..10] and an optional payload for the command. - Number of times to open the URL Open the URL the requested number of times. Hardcoded to sleep 2s every iteration. 8  - URL for download. From what I've observed the first command after subscription is generally '10' which instructs the infected host to begin sending a heartbeat every 60 seconds. The heartbeat will continue running on a separate user thread while the malware waits for the next command from the server. There are two commands the C2 server can send for updating infected hosts; an online update or an offline update. An offline update instructs the client to make another connection to the C2 server. Once the updated rat is downloaded it will call uninstall to remove the existing version then launch the updated one from the temp file. The same process seen in the update offline is followed, the new version is downloaded into a temporary file and the client uninstalls the existing version and updates to the newly downloaded version. The server can issue the command Id 8 which instructs the client to download and execute the downloaded file. The payload for this command includes the URL to download the file from and the extension to append to the file once it is downloaded. Once the file is downloaded the file is passed to an opener function where it determines how to launch the downloaded file. The opener first checks if the downloaded file ends in '.jar' if it does it will generate a string 'java -jar <downloaded jar>' and execute it. The server can instruct clients to open a URL. The payload to this command contains the URL to open and the number of iterations. The client will then open the URL the requested number of times sleeping for 2 seconds between iterations. Incident Responders looking for systems compromised by AlienSpy can extract host and network indicators from the properties defined in the config.xml file. Additionally systems would also be beaconing to the C2 server every 60 seconds. AlienSpy is used to deliver other malicious payloads to infected systems. Detecting the presence of AlienSpy should be considered to be only part of the compromise. If you have any samples, would like to collaborate feel free to reach out to me on twitter @seanmw. I'm interested in looking at how AlienSpy is being used in phishing campaigns to deliver malware. great writeup, thanks. Would have been nice if you included the network artifacts as well. I'm still looking at how the RAT is used to deliver malware onto infected systems, so I hope to have another post soon which will include packet captures. Creating "a Run key" for persistence wouldn't necessarily do anything...creating a _value_ beneath the appropriate Run key, with data pointing to the file to be launched, does provide persistence. Is there anything known about the value name? Is it consistent, random every time? My bad, I should have been more descriptive (dangers of late night posting). 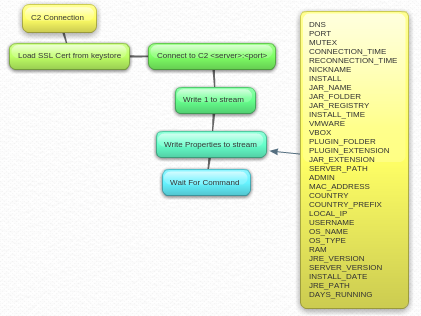 I've made a update to better explain that a value is created under the run key. The value name is defined in the JAR_REGISTRY config setting which would be random. And the data is a command line to launch the jar file. Has anyone managed to get this exploit to actually work (execute the .jar, create the subdirectories, go after the payload and drop it into place, and then execute the malware in the payload) in Linux? So far all I've seen is that the source code mentions Linux, OSX, Android, etc. But little evidence of actually working in those platforms. I don't quite understand the last tips you mentioned. can you explain it more specifically? I was recommended a free data recovery software named MiniTool Power Data Recovery. Have you heard about it? My friend said it was efficient and convenient. Tracking is needed to know your daughter is fine, have a peek at this here. Not only could they play and compete against each other, but they could do so on a level playing field as everyone, regardless of what type of computer they were using, was seeing and hearing the game in pretty much the same way. Visit this page if you don't wish to interrupt your kids' privacy but wish to monitor them. nice blog has been shared by you. before i read this blog i didn't have any knowledge about this but i got some knowledge so keep on sharing such kind of an interesting blogs. I like this topic.This site has lots of advantage.I found many interesting things from this site. It helps me in many ways.Thanks for posting this again.I really like this topic. very nice blog.YOU should clearly explain the different between blog and website.Thanks for sharing.keep sharing more blogs.If anybody want to build your website. Its a very nice blog, Thank you for sharing. keep sharing more blogs. Giaonhan247 chuyên dịch vụ gửi hàng đi nhật giá rẻ và dịch vụ vận chuyển hàng đi campuchia và vận chuyển hàng đi lào giá rẻ cũng như bảng giá gửi hàng đi úc và cước phí gửi hàng đi canada giải đáp gửi hàng đi mỹ bao nhiêu 1kg uy tín. Please free to call us @ +91 7871012233 else visit our Java Training in Chennai. 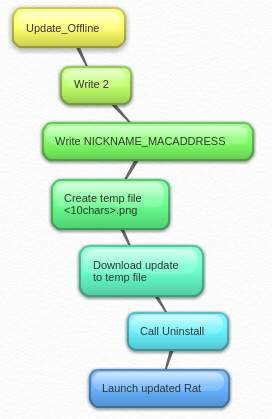 Thanks for sharing this overview admin, really helpful. Casino is not just a game but a lifestyle, come in, play and be stylish. roulette online The best casino is only on BGAOC and nowhere else. Very read worthy article. I'm really glad that I came across this blog. Keep us updated with more such articles. Thanks for sharing this wonderful article. Your article is very interesting to read.